Demonstrators blocked trucks delivering supplies to an arms fair Thursday to protest Netanyahu's visit. Sarah Reader of the Campaign Against the Arms Trade was among them. "The UK government has consistently sold weapons to Israel which are then used in indiscriminate acts of violence against the Palestinian people," she complained. Britain's Prime Minister David Cameron (L) greets Israel's Prime Minister Benjamin Netanyahu as he arrives at Number 10 Downing Street in London, Britain, Sept. 10, 2015. 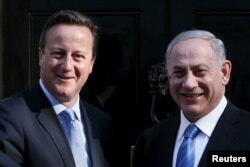 On Downing Street, British Prime Minister David Cameron offered his support to Israel before talks with Netanyahu. “Britain remains staunch in our defense of Israel's right to exist and right to defend itself. We also remain thoroughly committed to the two-state solution and the peace process," he said. While security topped the Israeli prime minister’s agenda, Netanyahu said he was ready to resume unconditional direct negotiations with the Palestinians. “The Middle East is disintegrating under the twin forces of militant Islam, the militant Sunnis led by ISIS and militant Shi'ites led by Iran," he warned. Six world powers signed a nuclear deal with Iran in July, that would freeze Tehran's nuclear development in exchange for gradual sanctions relief. Israel fears a Western rapprochement with Iran – and is keeping up the pressure to ensure the deal is verified. “What he’s trying to do is to build a case for the future if they find out the Iranians are not abiding by the agreement," said analyst Yossi Mekelberg of Regents University London, noting that Israel should change its approach. “How actually to incorporate Iran back into the international community and empower those who want Iran to become a more peaceful and cooperative part of the international community. Unfortunately, the Israeli political system doesn’t see it like this," he said. Analysts say Netanyahu is under pressure to return from London with something he can sell as a policy achievement to a concerned Israeli public.